Floor Restore are Dubai Marble Polishing Specialists. We have studied and understand the beauty of marble floors, showers and countertops. We also understand that everyday life can put wear and tear on your marble surfaces and leave them looking undesirable. Our Dubai marble polishing craftsmen have the skill and experience to restore your marble surfaces back to their original condition. Heavy foot traffic, acidic cleaners and spills can damage the original finish of your marble floors, showers and countertops. Inappropriate maintenance will only etch the surface and increase the need for professional refinishing. When you find your marble surfaces just don’t have their original brilliance, it’s time to give Floor Restore’s Dubai marble polishing technicians a call. Let us restore your marble surfaces back to their original beauty. Marble exudes the look of timeless elegance. It features a distinct crystalline aesthetic with intricate veining patterns in rich colours. Marble remains to be a trendy natural stone décor whose lustrous finish appeals to modern and classic decorators alike. Notably, marble’s lavish facade comes with delicate features. Marble has limited porosity, which means that it has low resistance against leaching, staining and moisture penetration. Marble, as opposed to other natural stones such as granite, is also known to be more chemically sensitive. Marble is made up of calcium carbonate, a compound that is highly reactive to acidic agents and chemicals. Continued exposure to chlorides, sulfates and chemical pollutants results in the rapid deterioration of marble floors. Strong chemical action corrodes the material and leaves the floor surface looking etched and damaged. There are other issues which contribute to the gradual degradation of marble floors. Poor maintenance leads to the build-up of grime, soil, dirt and mould between marble tiles and grout joints. Heavy foot traffic also ruins the reflectivity of marble floors, with shoe soles acting like sandpapers to wear off the floor’s glossy reflective shine. As such, the delicate nature of marble floors requires special care and attention during cleaning. Day-to-day cleaning won’t suffice, not when resort is made to acidic cleaners and harsh auto-scrubbers. Marble floor polishing, if done inappropriately without professional assistance, can create serious problems and do more harm than good. The better choice then is to entrust the task of marble polishing such delicate floor material in the hands of highly trained marble cleaning technicians. 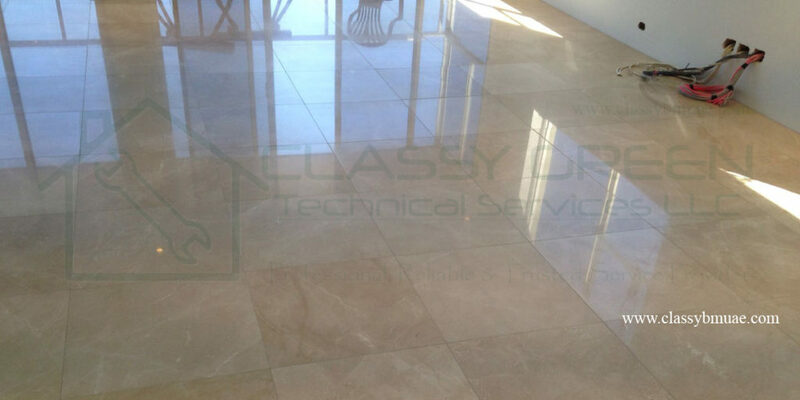 Marble Floor Restoration & Polishing Service at its finest, by Classy Green Technical Services LLC. Armed with 3 years of experience in specialized floor maintenance service in Dubai, Classy Green possesses the requisite skill and expertise to achieve exceptional cleaning results. At Classy Green, the process of marble floor polishing always begins with a systematic understanding of marble as a natural stone. This depth of knowledge serves as a key advantage as it enables us to employ only polishing techniques proven that is suitable for marble. 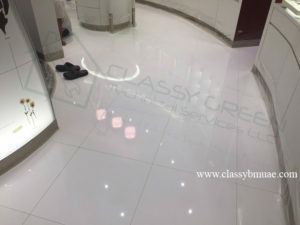 Classy Green’ unique brand of marble floor care solutions is undertaken by a core of competent cleaning technicians who know precisely what floor polishing techniques best complement the qualities of natural stone floor surfaces like marble. “Classy Green” approach to the process of marble floor polishing is characterized by distinct well-executed cleaning procedures. We take pride in our established methodology which adheres to the strict standards in the industry. We use finer grade pads to rid marble floors of light stone discolouration, fine scratches due to heavy traffic as well as surface stains and blemishes. Our trusted technicians avoid the pitfalls of using abrasive cleaners and chemical pollutants that worsen marble floor conditions. We also offer to apply quality sealers onto your marble floors. Once treated with sealant, marble flooring develops better resistance against stains, water and oil spillages, excess moisture, mould growth and dirt accumulation between pores. We apply only non-acrylic, solvent-based sealers which are environmental-friendly. After treatment, marble floor acquires improved lustre and durability. Whether you prefer a soft matte, low-sheen or high-sheen polish, Classy Green guarantees a high quality finish that leaves marble floor surfaces in smooth and pristine condition. Why Choose Us for Floor Polishing/Restoration & Deep Cleaning? Choose Service Excellence. Choose Classy Green. At Classy Green, service excellence is part of our tradition. Our track record as a leading floor cleaning service provider in Dubai speaks volumes about our commitment to excellence. We strive to keep our clients satisfied with satisfactory results, delivered on time. Let us help you restore the former glory of your marble floors. 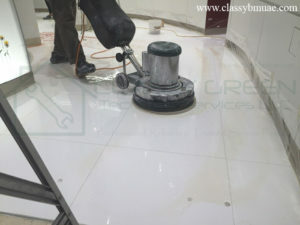 Choose to work with Dubai’s reputable marble floor polishing experts. Get in touch with our team today!